CHARLOTTE, N.C. | NEW YORK, NY (Thursday, August 2, 2018) – Tata Consultancy Services, (TCS), (BSE: 532540, NSE: TCS) a leading IT services, consulting and business solutions organization, and Discovery Education, the Charlotte-based leading provider of digital education content and professional development for K-12 classrooms, this week announced the Charlotte, N.C. launch of their Ignite My Future in School (IMFIS) initiative. Through this initiative, 140 middle school educators from across Charlotte-Mecklenburg Schools participated in IMFIS Days of Discovery at Northeast Middle School and Northridge Middle School. During these professional learning events, hosted August 1 – 2, local educators connected with Discovery Education’s professional learning experts to learn about the Ignite My Future in School initiative, understand its purpose and develop new strategies for integrating these new resources into classroom instruction. Much like critical thinking, computational thinking equips learners with essential skills for solving complex problems to find innovative solutions by collecting and analyzing data, modeling solutions, or applying algorithmic thinking. Ignite My Future in School combines the best of digital content, lesson plans, career vignettes and professional learning to help teachers prepare their students for careers of the future. The initiative offers educators instructional resources and year-round curriculum support to ensure that computational thinking is embedded into core subjects such as math, sciences, arts and social studies. This interdisciplinary approach helps students to obtain the necessary skills required for 21st-century careers across all industries. The Ignite My Future in School initiative will help guarantee that Charlotte-Mecklenburg Schools continues contributing to the strong talent pipeline that advances the region’s leadership position in the financial sector. Currently, Charlotte stands out as a strong job creator and talent attractor in the fintech space, and the region is the third-largest banking center in the country. With more than 17,000 technology jobs than graduates, the city needs future employees with robust computational thinking skills and abilities – Ignite My Future in School intends to help fill the talent gap. 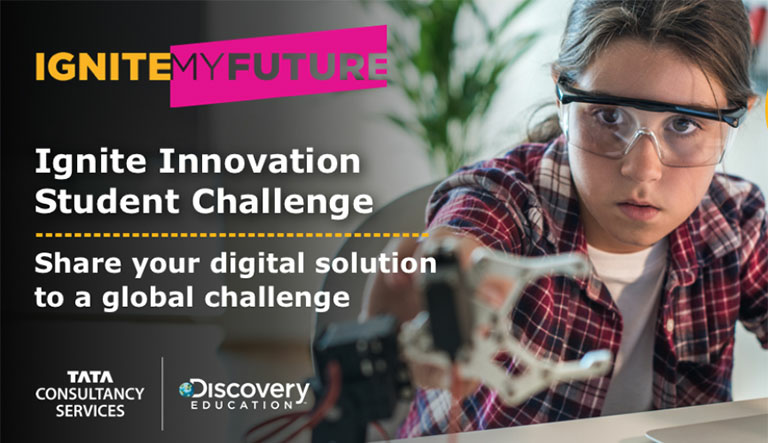 TCS and Discovery Education have also launched the digital platform IgniteMyFutureInSchool.org to provide teachers nationwide with exclusive, cost-free, virtual professional development experiences that include lesson plans, curriculum resources, eLearning courses and webinars. These resources are aligned to U.S. standards, as well as the K-12 Computer Science Framework. “No priority is more important than ensuring students and communities have the tools and pathways needed to compete in the multi-faceted workforce of today and tomorrow. Through Ignite My Future in School, our goal is to cultivate innovative approaches that build on Charlotte’s track record of success as we move into an era of digital transformation and rapid economic change,” said Balaji Ganapathy, Head of Workforce Effectiveness, TCS. On a national level, Ignite My Future in School has a goal of engaging 20,000 teachers and one million U.S. students by 2021. As a first step towards this objective, TCS and Discovery Education have partnered with U.S. school districts in the Washington, D.C. area, Georgia, New York, North Carolina, Pennsylvania, Texas and Wisconsin as early adopters and launch sites of this transdisciplinary approach. Since launching in 2017, more than 3,300 educators and 185,000 students in all 50 states have accessed Ignite My Future in School resources– providing training materials valued at more than $2 million. To learn more about Ignite My Future in School, go to ignitemyfutureinschool.org.